So today’s tip of the day is nothing at all to do with game design, or game development, or anything like that. This is because it started as a tweet! The lovely Matt Thrower, who’s written some very insightful words about games for places like Shut Up & Sit Down and The Guardian (not to mention this fantastic guide to the hobby), did a tweet earlier about his miniature painting woes. I've always been a slow painter, even when I did it regularly for the WFB circuit. Lots of tutorials on how to paint better, not many on how to paint faster. I started typing a response, then realised it was something that would be better expressed as a blog post rather than a twitter thread. So here we are! Maybe some other folks will find it useful. For those that don’t know, I worked in Games Workshop retail stores from 2002 to 2011. 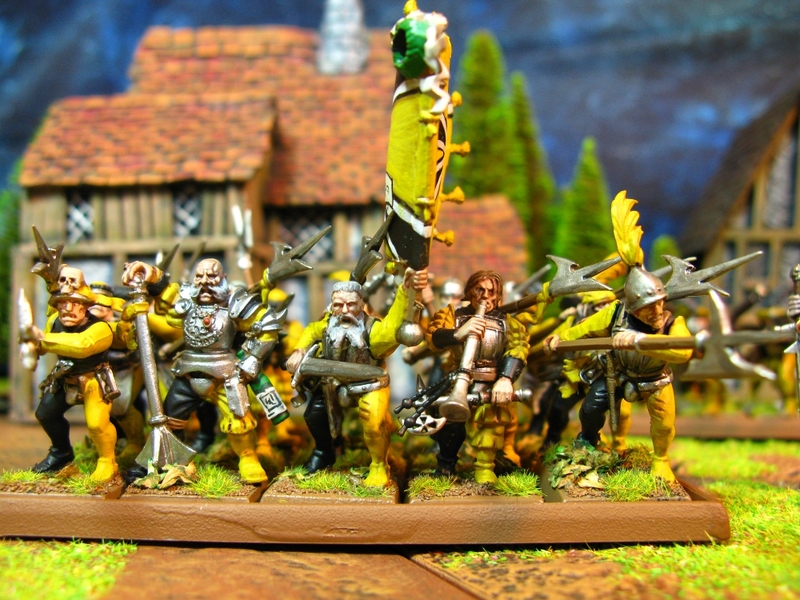 When I first interviewed for the job I was dead nervous about my painting - I was 18, I was a fanatical gamer, but I’d never painted more than a handful of minis (and they were all appalling). 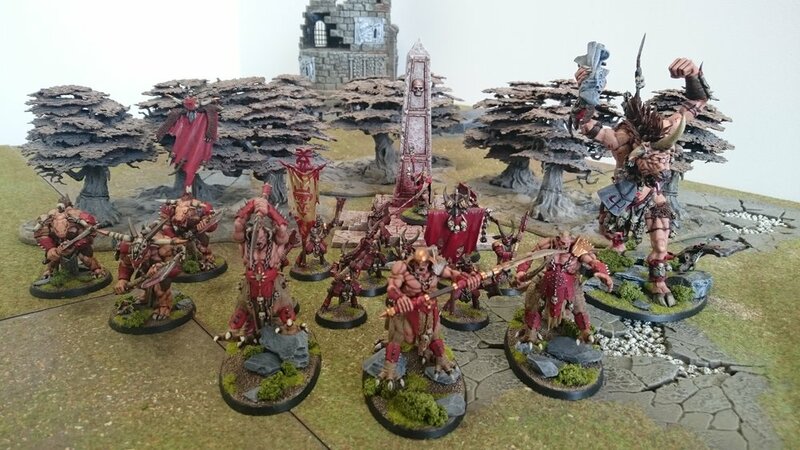 Back then, the stores only tended to hire people with a full skill set; the interview (in a pub over the road, because Things Were Different) included a series of questions about the Warhammer setting, and required me bringing in a painted army so they could see what I could do. I ended up frantically painting my Orks (mostly Gorkamorka stuff!) over the course of a fortnight, and all of it looked dreadful. I somehow got the job - luckily they had some amazing painters on staff, and I think Gary (the manager at the time… and still the manager at that store now, somehow!) decided I’d hopefully pick up some advice from them. So, anyway, over the next decade I did indeed pick up a lot of tips and tricks. To this day I’m still not someone who particularly enjoys painting, and I’ve only got a couple of painted armies despite having a garage full of Warhammer related stuff, but I’ve churned out countless miniatures for display cabinets over the years! I did these for a hobby challenge while I was working at GW, and while they paled in comparison to what everyone else had done, I’m pretty chuffed with them! I used the method detailed below, with just a couple of added steps on the bigger models. While I’m never going to win any awards for my painting, I like to think I know a thing or two about painting stuff quickly and to a decent standard. So, for Matt and anyone else who struggles to get stuff done quickly, here's the Hewitt Method of Bodging An Army Together in Ten Pretty Easy Steps! Break down your painting project (your army, or whatever) into achievable chunks. Five to ten models is a good bet. You’re going to paint in batches to speed things up, but you also want to get a sense of achievement - painting all of one colour on a hundred models might well make you cry, but doing ten to completion will feel great (and will still be a lot quicker than doing models individually). Once you’ve assembled your models, before undercoating, texture the bases. Textured paint is a thing now but I’m still a fan of sand - I tend to do 3-5 models at a time, painting watered-down PVA glue on all their bases then dunking them all in a tub of sand. If you do one at a time (paint glue, dip in sand, paint glue, dip in sand…) you’ll either spend more time rinsing your brush or risk gumming up your brush. Either way, don’t use a good brush for this. Spray everything black. Use a spray stick if you want to be efficient! Hobby hero Duncan Rhodes is another GW retail veteran, so it’s no surprise to see him showing off this technique here. This bit’s crucial: paint ONE of the models using steps 5-9 (not 10). This is your test piece. This does a couple of things: a) it lets you try out your colour scheme; b) it lets you figure out how you’re going to paint everything (is that bit going to be cloth, or metal, or wood? ); c) when it’s finished and you get to see how cool it looks, it’ll get you excited about doing the rest of them. And again, just the sense of achievement from Finishing A Thing will perk you up! Once you painted this mini, go back and do it with the rest, in a batch. Line them all up in front of you and do step 5 on all of them, left to right. Then step 6 on all of them, left to right. If you get interrupted, or you want to pause your painting session and come back to it later, all you need to do is leave them in situ with the one you’re working on pulled out of the lineup, and you’ll be able to very easily pick up where you left off. Do any drybrushing that needs doing. Metal looks good when drybrushed. So does fur. So can a lot of other things if you’re sneaky! You can get away with a surprising amount of drybrushing on model if you also have some very neat areas as a contrast. Do maybe two coats, a darker shade then a highlight, working down the line for each. Also, do the base at this stage (drybrush it, then quickly paint the edge of the base). A lot of people leave the base until last, but that’s a mistake, because a) it adds a boring, laborious step to the end of the process when everything else is done, b) you’ll end up getting paint on your models’ feet, you know you will, and c) a painted base will make your models look like they’re way closer to being done than they are, which is a good boost at this stage! Get your proper brushwork on. Pick a colour and paint all of that colour on each model going down the line. Neatness is good here, but don’t stress too much. I tend to do faces and any deep recessed detail first, then large areas of colour, then small detail like belts and pouches. Plan ahead, and don’t worry about getting paint on an area you’re going to paint again later! Also, the Two Thin Coats principle applies here - say you’re doing "green cloaks”. Go down the line doing a thin coat of green on all the cloaks, then go down it again with a second thin coat. This will look SO MUCH BETTER than a single thick coat, which will look patchy and naff. At this stage, don’t worry about highlighting. We’re going for speed and efficiency here, so pick a single decent colour for each area that is a little bit brighter than you want it to end up as. If you want dark green, use a mid green instead. Paints with high pigment values (like citadel Base Paints) are what you’re after, really. Using the same method (one paint at a time, going down the line) but with only a single coat this time, apply shades / washes to all the bits you painted in step 6. Also to the bits you drybrushed in step 5 if necessary (the test model will let you figure this out). This one’s optional, and can be ignored for rank-and-file models in large armies. Spend a bit of time on the faces and any other prominent bits that draw the eye (head, shoulders, and anything that sticks out). When people look at person-shaped models the first things they tend to see are faces and bases, so a little bit of time spent on those will give a great first impression of the model - and if people are looking at your army as a whole, that’s more than enough to make it look like you know what you’re doing! Add things like static grass (great for covering any paint you accidentally got on the base during steps 5-7), waterslide transfers or unit markings. Stuff that isn’t necessary but will add a bit of flair. Keeping this until the end is good insurance in case you run out of time before an event or deadline - if everything is painted up to stage 8 it will still look fine! They’re done! Take a bit of time looking at what you’ve achieved. Post some photos online. Get excited about what you’re going to paint next. Congratulations! This technique has never failed me. 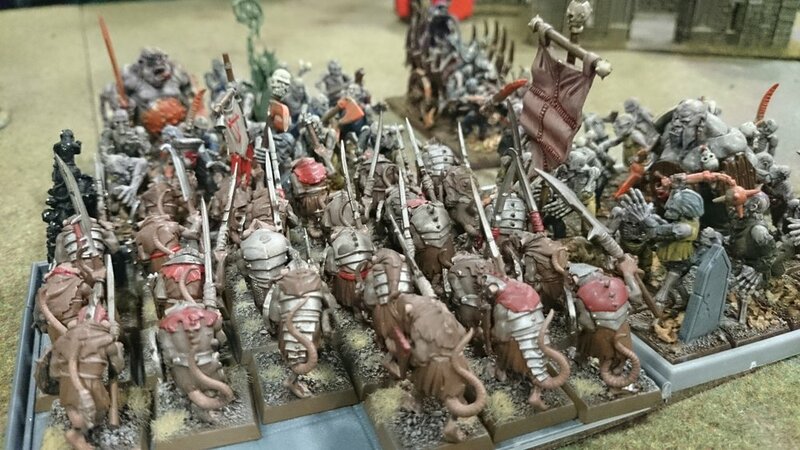 At its most intense it got me through a large Skaven army - while painting 120 clanrats, I actually kept the models on the spray stick up until step 7, then applied a watered-down brown wash all over with a spray gun! I was bashing out a unit of 20 in about 45 minutes. They didn’t get a step 8, I’ll tell you that much. They’re no nicer from the front, but look! They’re painted! My finest achievement was at the Warhammer 40,000 Battle Brothers event a few years ago, when I was working in the publications studio; Sophie and I partnered up with an Ork-Ork alliance (my bright red freebooters and her Bad Moons) and I painted my half in about three or four evenings, immediately before the tournament. We managed to win the Best Army award, which was frankly astonishing - but we had a very bright, cohesive colour scheme, everything was neat, and we spent time making things like bases look cool. So technically, when I said earlier that my painting will never win any awards… well, that wasn’t entirely correct! There we go. A way-too-wordy-for-a-tweet guide to painting stuff the James way. If you like, you can see some examples here - this is an Empire army I was painting for an ongoing campaign that died when I got a job in the wargames industry and immediately became too busy to run it. Quick and dirty, but does the job! Best of luck - and happy painting!